Transfer of files, from one device to another, has many medium. In PC, there came a complete changeover with the inception of floppy disks, CDs, USB drive, DVD and finally, in today’s date Online transfer applications. There are many applications both for computers and mobile phones, where simply by through Wi-Fi one can send a large amount of files within few minutes. Out of many available, Shareit is the recent user favourite app. But still then it has a big issue that is bothering users and that is its failure to connect to the nearest mobile or PC. If you’re facing the same, you will get the solution right over here, in this article. So keep reading until the end. The makers of Shareit have made significant innovation and development to make its graphic interface simple and easy to understand. so as to avoid unnecessary fluctuations. Connecting with friends: It provides incredible facility to share photos, music, video, apps, PDF, and other files with no restrictions on size. Connect with your computer: A unique ability to Connect to your PC and view files on your mobile. Access to control your presentations from your mobile. Backing up valuable data in a second. Replicate your phone in one tap: Easily transfer and back up contacts, messages, apps, all types of files from your old phone to new one. Every new version of SHAREit put forward some new improvements. Its PC version is still yet to be developed completely. This is the main reason, users face shareit problems while connecting Android devices with PC. The problems those have been observed during the use include application frizzing, connection loss during files transfer and most major one, failure to connect to the nearest device. When the application fails to connect, either it displays “Connection time out” or “Connection failure error”. These issue could be caused by the inability of connection between your PC WLAN hardware and phone . You should also check whether antivirus firewall is restricting the connection. In occasional cases, frizzing could be the result of being unable to be compatible with operating system or some bug. We have mentioned some solutions below that might work for you. If SHAREit is not linking over WiFi or hotspot, disable the antivirus or firewall on PC and check. If the problem is resolved, make it allow for SHAREit in firewall settings. Open SHAREit mobile app on your Android phone. Click on avatar/profile icon on top left corner. A menu will open. Click on “Connect to PC” option. The device will search for PC hotspot nearby. Just click on “PC Search Mobile” button located at bottom right. Now SHAREit app will create its own mobile hotspot. 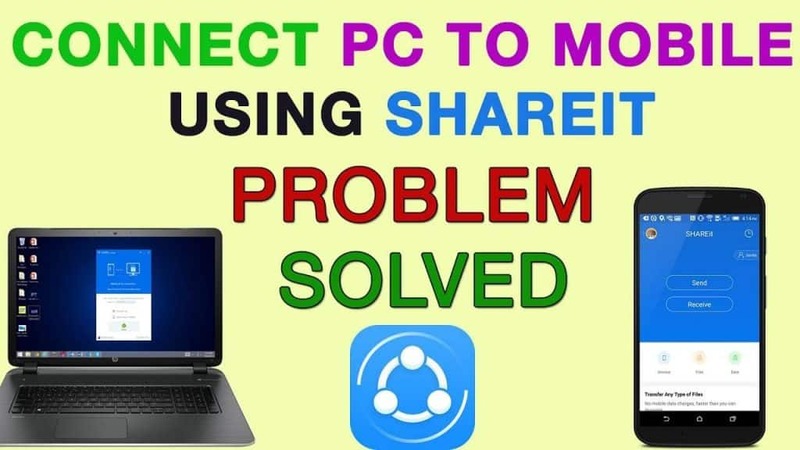 Make sure that you have SHAREit PC app opened on your PC. Disconnect from internet (Wi-Fi). 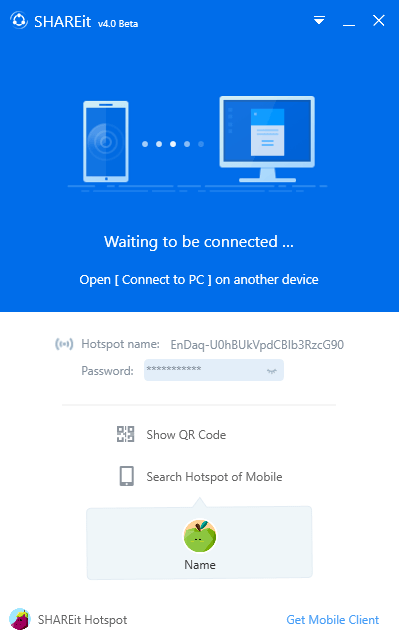 It is necessary as PC will not be able to locate mobile hotspot and connect to it. A large pop up will appear on interface of SHAREit PC. Click that and you will connect to your mobile phone after a confirmation dialog. Now you can transfer files between your PC and mobile device. SHAREit perform steps automatically on the mobile phone while connecting. It automatically turns off internet connection and turns ON Wi-Fi. If not, user should take the action (as described above). Often it is unable to create a hotspot on PC when you have turned on the mobile data or already have connected to other applications. 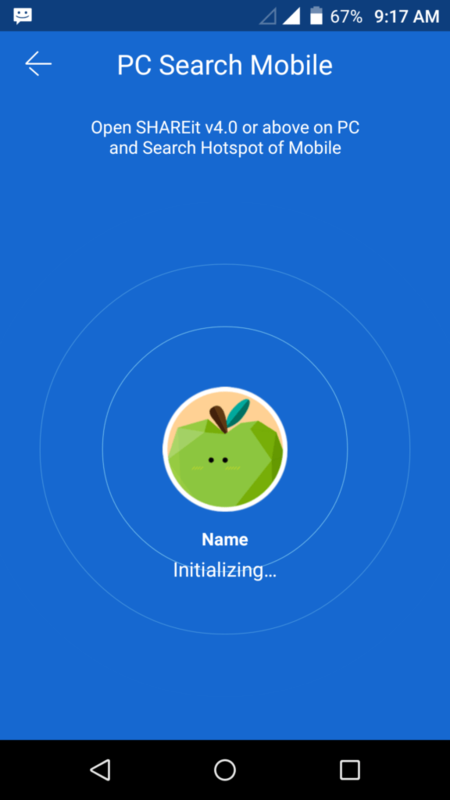 Note: Do perform Reboot and close other apps while using SHAREit. It will help you to make a connection. Do check your device storage space. This is the important factor to consider and files cannot be overfilled in the system storage but only to the required limit. If you are trying to send files of large size through SHAREit, then better to send them in fragments, which means, rather than sending them in a whole lot send few of them at a time. It depends on the size and condition of your processor, If you have an old processor with filled up storages, Large sizes files will take a longer period of time if sent in lot, so you have to make some room inside your phone and should try to send them one or two at time. It will be lot easier and faster. Check your country’s technology and software enforcement guidelines, to look out for those apps which might have been included in their “most vulnerable and hacking prone” applications. So, do perform all the steps listed above next time you face any “Connection time out” or “Connection failure error” issue while transferring files through Shareit. And, if you get across any new hack to resolve this issue, don’t hesitate to comment below and let us know more shareit problems.